A Quick Congratulations for Your Dentist in Lynnfield! If you’re looking for a new dentist in Lynnfield, we have some great news for you! Schumacher Dental is proud to announce that one of our lead dentist and board-certified prosthodontist, Dr. Rob Schumacher, has been featured in the August issue of Boston Magazine for amazing dental work and dedication to his craft. When choosing a dentist for just you or your whole family, why not go with the best Lynnfield has to offer? 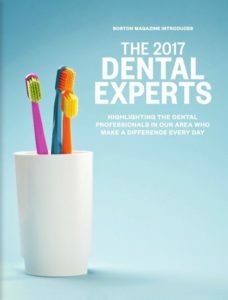 We want to take some time to highlight Dr. Schumacher’s accomplishments and congratulate him on his new feature in our local magazine so you too can see why he’s a great dentist for all ages and dental needs. After being featured as a top dental expert in this August 2017, Dr. Schumacher has taken this opportunity to explain a little more about himself, his foals, and what he loves about dentistry. After being asked where his passion for dentistry comes from, he stated, “My passion for dentistry originates in my love for the beauty of art as well as my desire to add intrinsic value to the patients I serve. I love incorporating artistic design by using both traditional and current technological methods to create beautiful smiles that my patients love!” What more could you ask for in a dentist? Dr. Schumacher has been in the dental field for the decade and a half. He takes pride in providing patients with effective, well-rounded, comprehensive services. These are some of the reasons why Dr. Schumacher became a prosthodontist. In fact, less than half of one percent of dentists in the U. S. are board-certified prosthodontists. General dentists do have to undergo extensive studies. Dentists are required to earn a four-year dental degree at an accredited educational institute, but as soon as they accomplish that they can start working on patients. If you’re looking for a dentist that can provide the services that your whole family needs, you’ve come to the right place. Dr. Schumacher and the rest of our dental team believe in not only helping the community by giving back with exceptional dental care, but we believe that our local loyal and new patients deserve to have healthy, bright smiles, too! We provide a variety of services from general preventive care to keep your teeth and gums strong, to cosmetic dental services that will help you achieve the smile of your dreams. Whichever dental treatment you need, you can rest assured that it will be customized to your needs and wants. When Dr. Schumacher isn’t servicing the community with well-rounded dental services, he loves spending time with his family. His wife and three children get his attention and fun hobbies like hunting, traveling, and photography keeps him entertained outside his practice. Do you need to get in contact with Dr. Schumacher? Feel free to schedule an appointment by dialing (781)463-5162. Comments Off on A Quick Congratulations for Your Dentist in Lynnfield!